It was with fascination I recently read Shaun Hazeldine’s piece on Rethinking the Future of Volunteering? While written about the global Red Cross/ Red Crescent Movement, the way it resonates with the work we’re doing at the British Red Cross is uncanny. So much has been written about the changing nature of volunteering in the UK and globally, so it’s heartening to see how seriously people are beginning to take the important issue of putting the volunteer themselves at the heart of the experience we offer. If we’re to get close to meeting the ever growing and changing needs of people in crisis we have to ensure our volunteers aren’t just highly skilled and amazing, but that we make their experience with us as slick, effective and enjoyable as possible and enable that experience to change and adapt according to the needs of the volunteer, treating volunteers less as an unpaid workforce and more as part of our supporter base, part of a movement! There aren’t many Movements where volunteering and voluntary service are so explicitly part of their DNA. So we have a duty, in being true to our roots and the vision of our founder, to remain relevant in this space. Globally the Movement’s volunteer numbers are ‘at best stagnating’ yet we see no shortage of volunteer led movements emerging. The UK Civil Society Futures report talks about a power shift where increasingly ‘those with direct experience of the issues being involved as experts.’ People with experience become the architects of their own solutions in their own communities (often global communities). A proven example of this is the #MeToo movement, described by Yves Daccord as a ‘belated wake up call, not only about the problem of sexual abuse and exploitation, but also entrenched power imbalances’. A view supported in Civil Society Futures where they talk about people ‘loosing trust in large institutions, including charities, which are too often ridged, unaccountable and distant from the people they are meant to serve.’ So how do we rise to the challenge and make volunteering and voluntary service as part of the global Movement fit for purpose in 2019? How do we respond more effectively to the needs of volunteers themselves, as so excellently articulated in the recent Time Well Spent report from the National Council for Voluntary Organisations (NCVO)? Well, the first thing we did at the British Red Cross was to ask those people who have come into contact with us most recently how their experience compared with their expectations. Having identified the pain points we then asked everyone we could find how best we might address them, launching an online ideas platform and a UK-wide series of workshops. If you have ideas about how to improve the @BritishRedCross volunteer experience, go to https://t.co/MlHX8EtImt We want to hear from you. Over 300 ideas and 2,500 online votes then became 6 concepts which, in turn, informed the development of a number of new user (customer) journeys. We see voluntary service at the British Red Cross as a living, breathing and evolving fundamental principle. So, in 2019, working collaboratively across the organisation and beyond we’re really excited to be embarking on a journey of discovery, turning concepts into reality! We’ll build stuff, test it, adapt it, break it but all the time learning how we can improve and iterate to deliver the best and most relevant and engaging experience for our volunteers that in turn enables us to better serve people in crisis. Challenge is, as the world around us and the wants and needs of volunteers and people in crisis keep changing we need to set ourselves up so we can build, test, adapt, break and learn on an on-going basis. That’s not necessarily something we’re comfortable with, but to remain relevant as well as true to our fundamental principles we can’t simply stand still, we have to continuously improve and adapt. So while this is a challenge, for me it’s an exciting one and one I hope you’ll follow with as much interest as me. Do get in touch if your interested in hearing more about our work to date and the progress we’re intent on making throughout 2019 and beyond! Fab article. Captures why I do volunteer and the journey I have had. Thanks Jay, fingers crossed we can make that journey better! 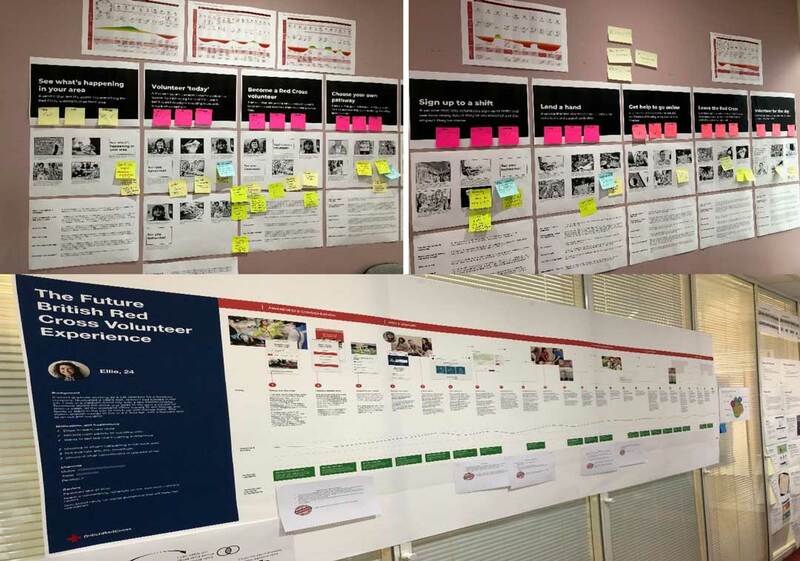 Fabulous to see a user centred iterative design process being used to improve volunteering. And with real commitment to making it work. Will be following progress with interest! Thanks Janet, we’re just about to recruit to a new post to ensure we maintain momentum on this, keep an eye on my LinkedIn profile over the next few days to find out more!